Spring is a time of increased energy, vitality, and overall renewal. It certainly looks like Twitter has caught its own version of Spring Fever. Clearly on a roll this week, Twitter issued a new version of twitter.com for mobile devices Wednesday, and releasing a huge update for Twitter for Mac today. The app was released to only a small number of iPhone, iPod Touch, and Android smart phones, however, Twitter promises to continue releasing it over the next few weeks. With regards to Twitter for Mac, today’s update is the first major software update released since Twitter acquired Tweetie and its publisher Atebits back in April 2010. The most prominent addition is the new multi-window feature, which allows users to view things like their @mentions, timelines, lists, and multiple timelines, all at once in different windows. Twitter has also made this feature easy to access: simply go the Windows menu and scroll to the aptly named “Open New Window” option. Further additions in Twitter 2.1 include a new toolbar that lets users click back to previous pages more easily and a separate “New Tweet” button in the bottom left hand corner of the app. An improved Direct Messages design makes it easier to view conversations and user profiles. Finally, the app also has username and hashtag auto-complete. 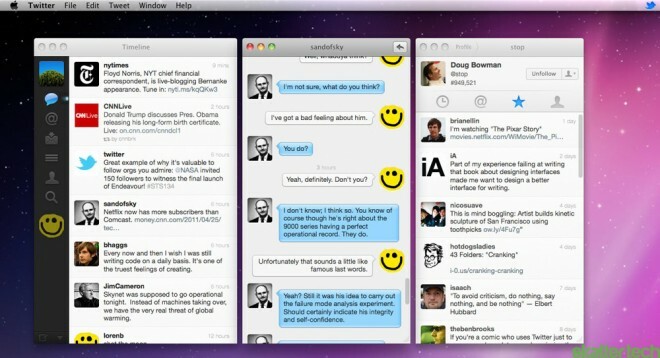 Twitter 2.1 is currently available at the Mac App Store. Keep an eye out for further Twitter high-quality upgrades and releases over the coming weeks, or even days, since they’re obviously on a roll when it comes to releasing product updates.